Welcome to another Friday Feels where I share what I’m “feeling” this week. This post may contain affiliate links. It’s eleventy billion degrees here (what’s up with that Michigan?) and I’m trying to feel fall this week, but the fact that I’m currently sweating on my front porch in a tank top writing this is making it hard. I couldn’t even bring myself to buy pumpkins this week, not that I’m complaining too much as I know the snow will fly soon. I was planning on sharing my fall window boxes with you all today, but with this summer weather my flowers look too pretty to rip them all out. See? I couldn’t bring myself to switch them out yet. Hopefully it cools down next week, and I can show you what I have up my sleeve. Also, I wanted to thank you for your awesome response to last week’s Friday Feels podcast post. You guys, if you are looking for new podcasts to listen to, read the comment section on that post. SO many awesome suggestions, I started a list! See the post here. Ok, so today I’m talking about our TV cabinet. I have gotten lots of emails and messages wondering where our TV is in our living room and, or how, we hid it. So, I thought I would show you all just how the awesome cabinet guys built this contraption. I knew in this house I wanted the TV completely hidden, so I decided right off the bat when I was drawing the fireplace design and cabinets to make the lower section closed cabinetry. I wish I would have saved more of the drawings the Mr. and I made, it’s crazy how close to our drawings the house ended up being. The guys did a great job of bringing our vision to life. The guys built this extended square box in the back of the cabinet to mount it to and it fit perfectly. I’m making that sound a little too easy as there was definitely A LOT of measuring and numbers tossed around, but I sort of zoned out for that part, which I tend to do when math is involved. Thank goodness the Mr. is a self-proclaimed number nerd. They couldn’t build shelves all the way across obviously, because the cabinet doors wouldn’t be able to slide back into the cabinet then. They built this little bookcase within a bookcase so that we had a spot to set our other electronics. 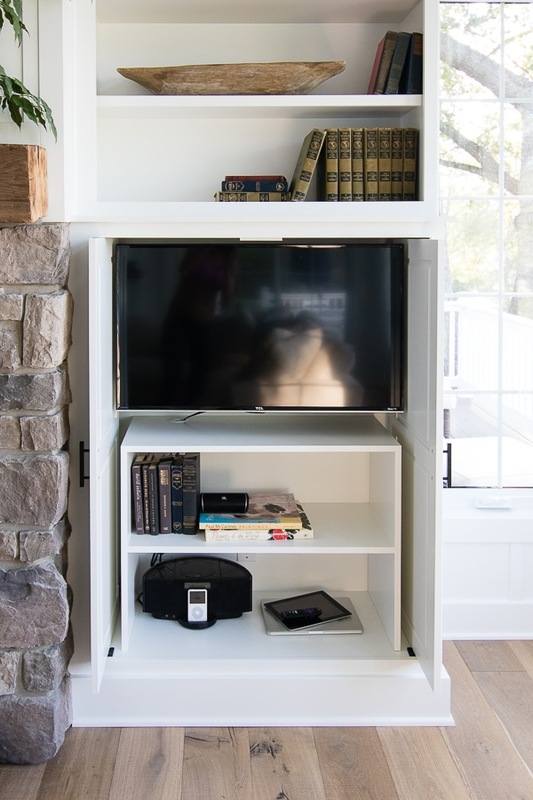 This is a smart tv so we don’t have a cable box for it, but if we did, we could tuck it on these shelves too. You can see it works perfect – it pivots out so I can even see the TV from the kitchen, which is awesome because I like to watch the news while I cook dinner. Then it slides right back in and the doors pull out and close. I love that you would never know it’s there, plus it’s at a nice height for your eyes vs. having to look up if it were mounted above the fireplace. 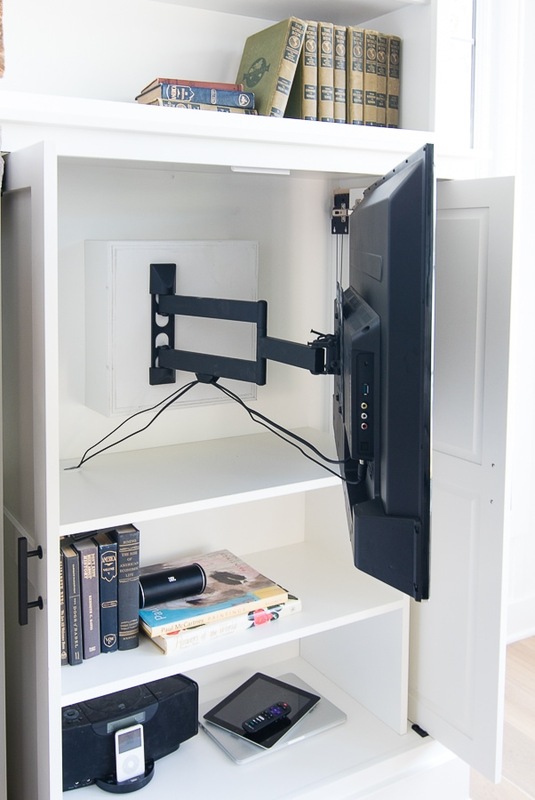 Door size – 20 x 50, the doors stick out 2 inches when they are slid back in the cabinet. Feel free to comment below if you have any other questions! Ingenious!!! Looks like you and the Mr thought of everything. OK, I love the cabinet and everything about your house, but what I need to know is what do you mean that you don’t have a cable box because you have a smart TV?????? I’v Never heard that before. Maybe it’s just my cable provider doesn’t offer it but I’m super curious! SOME of the new smart TV’s have a built in RVU. This is basically a built in cable box. We have 3 smart TV’s but only 1 of them has a RVU built in so ask that question if you go to buy one. Hope this helps! I’m not a tech expert but just had a new provider install service. So our smart tv has hulu, netflix, amazon etc built right in so we stream all of our tv vs having cable. We have an antenna for local stations but we don’t watch much tv. Thank goodness – no huge TV overpowering your livingroom, and nothing over the fireplace – shame, shame, on whoever thought installing a TV over a fireplace mantel looked attractive. Your home is lovely, I look forward to your next post. I think what attracts me most is the simplicity and the light. What IS up with this weather… I’m in Grosse Pointe and drove up to our cottage at Higgins Lake and it got hotter the further north I went?! Love your house, and that cabinet is great!! 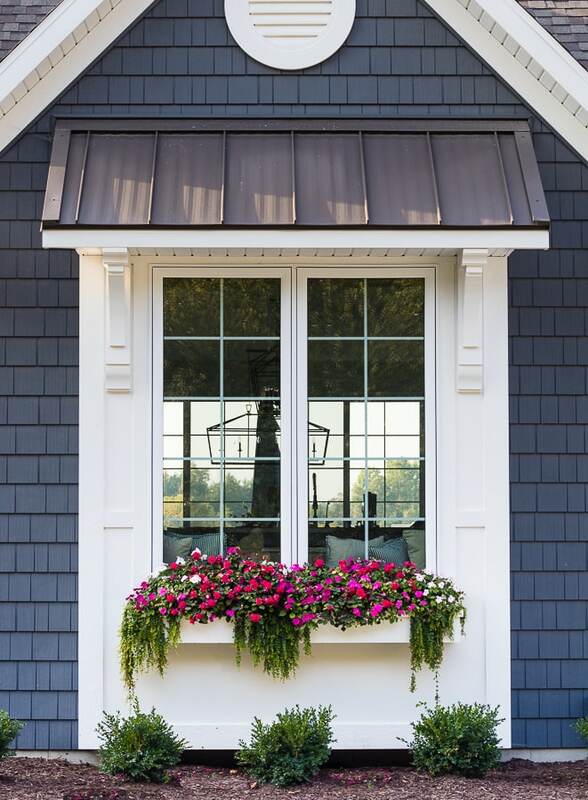 The window boxes in your old house are what drew me to your blog int the first place. I look at them as your signature statement. The colors are absolutely beautiful, as is your new home. 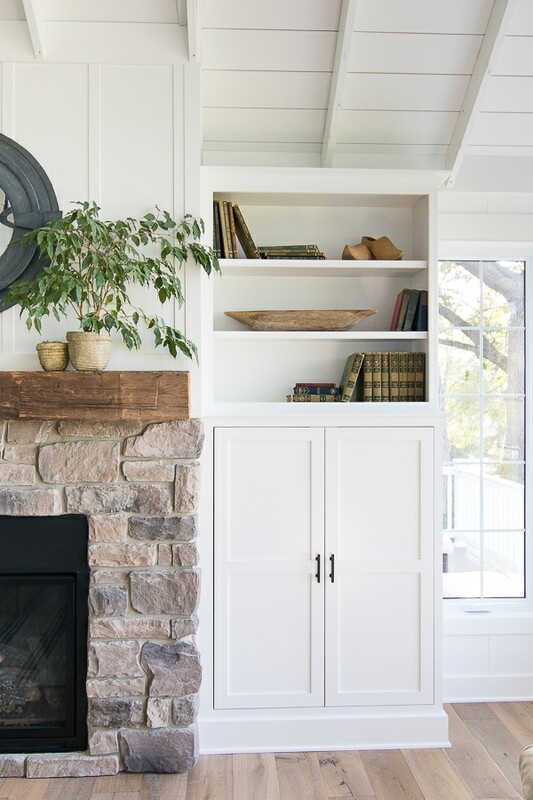 What is the stone on the fireplace? Is it a veneer? 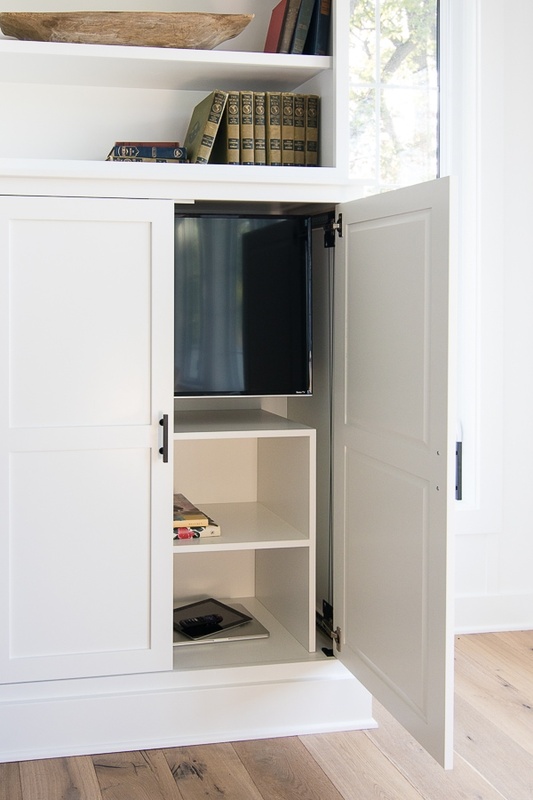 I love the idea of hiding the tv. Hate to mount over the fireplace and this is a perfect alternative! They are veneer stones yes – thanks! Love this! I have an enclosed cabinet too and so appreciate being able to hide it! New to your blog and I am loving it! Would also like to know about the stone, and also the yummy white paint you have chosen. The paint is extra white by sherwin williams. If you type lake house living room in the search box on my blog it says the exact name of the stone, I can’t remember at the moment! This room is beautiful and you would never know there’s a TV there since it isn’t a massive media center built-in. I love having the TV hidden and it’s the one thing I can’t wait to change about my own living room. Yes we didn’t have it hidden in our last living room and it always bugged me! I continue to be amazed by your house! It is all so beautiful! I have a question on your vertical wall trim (what type/size of wood or mdf did you use?) I know it’s all painted and looks fabulous, thinking of adding it in our living room. Thanks! Hi Andrea I know it’s actually wood slats and I think they are about 1 1/2 wide. Thanks! 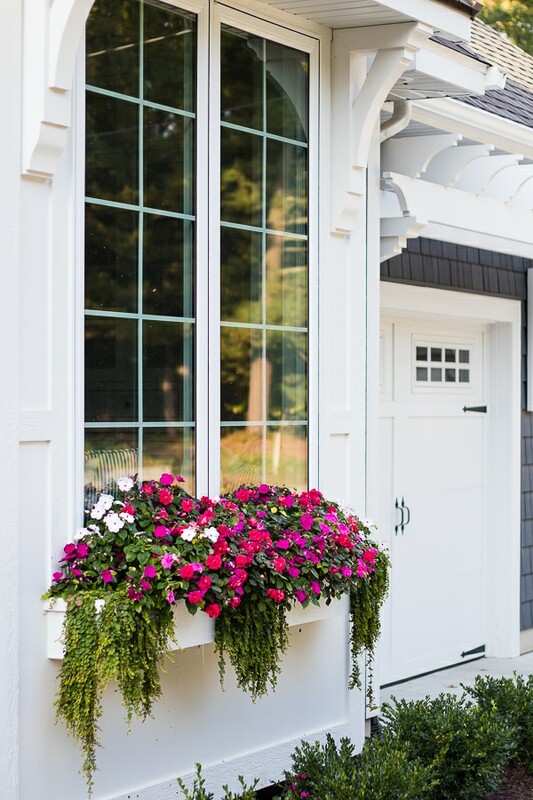 Looks amazing but I have a question about the actual window boxes themselves. Did you build them or buy them pre made? And how are they attached? I’m dying to hang one up! The guys built them for me, there are metal brackets attached to the house that a plastic liner rests on and then there is just a wooden cover around it, thanks! Your home is just beyond beautiful! I did have a question though. I noticed that you have no lamps in your living room. Do you just use the chandelier? Hi Kathleen there are actually cans on a dimmer in here as well. So we use those if we want less light. This chandelier kicks off a ton of light. We have a plug in the floor for a lamp but I can’t find a lamp that doesn’t block the view. So, so far I don’t miss having one. I was just up your way to visit family and friends and was disappointed that it was so hot out, especially because I didn’t bring enough summer type outfits! The flowers in Owosso, where my parents and several siblings live, still were so pretty too! Headed over to South Haven and enjoyed the beauty of that place too…how I miss Lake Michigan! Anyway, the TV hidden in the cabinet is awesome! I hate it when a TV is up above the fireplace and you have to look up….makes my neck ache. Beautiful home. Just stumbled onto your blog. What type of wood floors do you have? Also any tips on caring for window boxes and keeping them moist enough in hot weather? If you search my blog for “flower box tips” a whole post will show up there are these moisture beads I mix in my dirt that are amazing! Would you mind sharing your cabinet maker? I’m from Spring Lake, MI and I’m looking for someone who is really good. Also, you mentioned you got your sectional from Art Van. Was it the one on 28th Street? Do you remember the name of it? It would be perfect for our basement. I don’t know the name of the sofa but it but it is on 28th st. In the store it’s in a dark grey tweed type fabric so look for that, it comes in a bunch of different colors. Hi, I love these units! I don’t suppose you could tell me where the handles are from please?! They are from a local hardware store in Grand Rapids MI, I don’t know the brand name – sorry!